A gather of clear glass is rolled over white glass powder, placed on a marver (metal table). A small gather of blue glass is applied. Then a small gather of black glass. The 2 colours are smoothed over, then the eye is shaped and cut off. The wooden handle is shaped on a lathe. Inside holes were drilled to allow glue and screw to fix the two components together. "Hard Look II"is an improved version of the original "Hard Look" which had no wooden handle and mirror at the base. These new features add an extra sensory experience in texture and a greater connection between the mortar and the pestle. 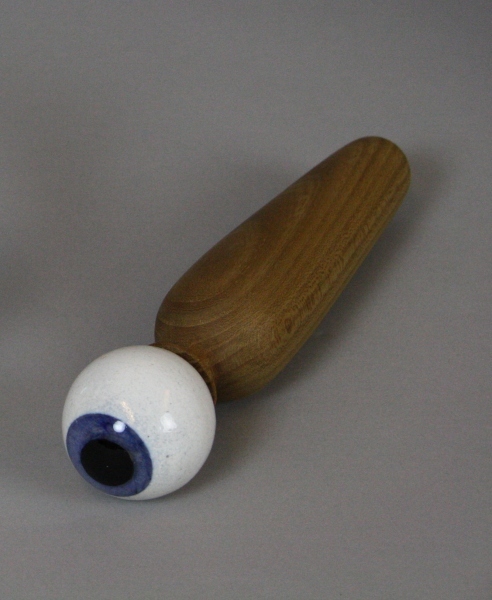 The idea of a mortar and pestle with an eye was inspired by our society obsessed by visual stimulation and the permanent aggression of the naked eye.